A USA trip starts with a rather long flight before you can pick up your rental car at Boston Airport (Logan International Airport). There is a variety of suppliers located at Boston Airport. Use our independent comparison portal before you start your journey to find a cheap rental car at Boston Airport that meets your personal requirements. The car hire company's pickup point for the car rental Boston is located at the airport on request. Find out more about the most important facts and figures about Boston Airport and rent a car for your trip to the USA. 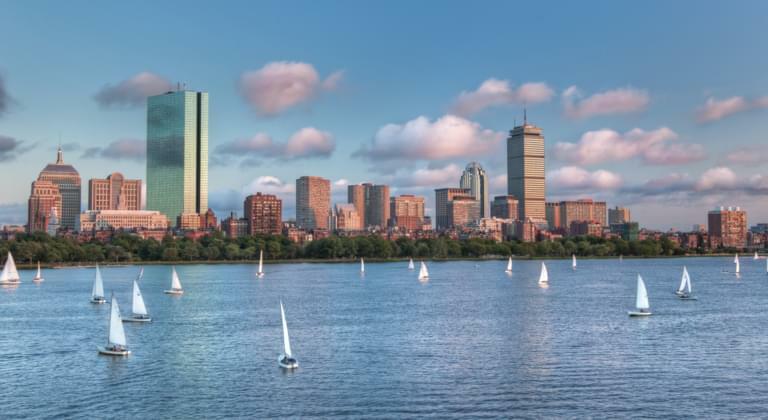 Hardly any other city in the United States of America exudes as much charm as Boston. The metropolis is located in the state of Massachusetts in the east of the USA. Since the beginning of American history, this city has played an important role. The famous Boston Tea Party in 1773 is well known from the books. Today, Boston inspires from a mixture of history, culture, economy and modernity. Brick houses are lined up with impressive skyscrapers and an interplay of old architecture and alternative architecture is created. There is a lot to discover within the city and also the surrounding area offers a variety of attractions. If you also want to get to know the city with all its facets, then a rental car is the perfect choice for Boston. Independently and flexibly, you will follow the footsteps of an enthralling history and have the opportunity to explore a new highlight at any time. Boston airport, abbreviated BOS, is only 15km from the city centre. An ideal starting point for your stay in the city. Logan International Airport is one of the 20 largest airports in the country. It was opened on September 8,1923 and has grown considerably over the years. In the end it was about 7km² in total. The airport currently covers an area of about 10 km². Today, some 35 million passengers are counted at BOS Airport every year and correspondingly many flights are realized. They fly to destinations in the USA, Canada, South America, Asia and of course Europe. Up to 50 different airlines land and take off at the airport BOS. Logan International Airport has a lot to offer. Even if you have to spend a long time at Logan International Airport, there is a lot of variety. Be amazed at the flights, which land and take off every minute and recover from your flight. Children are allowed to let off steam and play in a separate area, and even for pets there is a separate area at the airport. In addition, you will be well looked after and luggage storage is also available. Here at the airport you can rent a car at many rental stations. You can book the car of your choice for cheap online in advance. First of all, you should know that there are several car rental stations at the airport to choose from, and that you can also pick up your car from one of them, which was rented at a reasonable price beforehand. To rent a rental car for less, simply use our portal to find the right rental car for you. Terminal E and Terminal A offer stations for car rental and a corresponding pick-up station. At Tomahawk Drive you will meet different suppliers. In any case you can rent and pick up a rental car directly at the airport. In Terminal A, the main building, there is a large information desk so that you can find out exactly where the pick-up station for the rental car is located. You can choose from various pick-up stations at the airport. There is a pick-up point for the car rental service both at the airport BOS and a little further in the direction of the city centre. If you rent a car at a reasonable price and do not pick it up directly at the airport, you can either use a shuttle service or the public transport. Where can I refuel my Rental Car at Boston Airport? Before you rent the car for a reasonable price, you can see beforehand what the conditions for filling up your car are. Not every car rental company offers the same conditions. As a rule, the rental car must be handed in at the pick-up station with a full tank of fuel. If you also rent a car at the airport, it is of course advisable to find a petrol station close to the BOS. At the Interstate 90 you will find several petrol stations, so that you can fill up your tank again before leaving the car at the pick-up station. Interstate 90 is located directly at the airport. It is the main artery between the east coast and the west coast. With it you have one of the most important traffic connections right at your doorstep. From the Interstate 90 there are further highways and drives that will take you to other destinations or directly to the city centre. The Interstate 90 is the longest connection between East and West of the USA. It starts in Seattle and ends here in Boston. It cannot be denied that a trip to the USA is something special. Many plan such a vacation very meticulously and rightly. Flights must be booked. A flight does not always go directly, but most people want a direct flight. The hotels are also to be examined beforehand. Cheap booking doesn't always mean a cheap holiday. After all, you just want to enjoy the atmosphere on site and let all the impressions affect you. The rental car gives you the freedom to move around independently and flexibly. Cheap rentals are not limited to the rental price. Just like the hotels, you are welcome to ask what services are offered for the car. A fully comprehensive insurance policy with no excess and a fair fuel policy, for example, are two points you should pay attention to. This also applies to the comfort of the vehicle. Which car do you prefer? Take advantage of the independent comparison here and find the cheapest car hire company that can provide you with a cheap car for your Boston Tour. It's definitely worthwhile hiring a car for Boston. Start your tour through the city with a rental car and enjoy one of the best views of the skyline. Here at Piers Park in the East Boston Waterfront, the skyscrapers are reflected in the water: breathtaking. To get to know everything better, park your rental car at the Boston Common. This is a small, idyllic park at the end of which the trails through the city begin. Boston is full of history and thrilling stories. So what could be more obvious than to follow in the footsteps of this history? You have two paths leading you into the past. On the one hand the Black Heritage Trail and the Freedom Trail. The Black Heritage Trail tells the story of the country's first colourful people. From the beginnings of slavery to the end of slavery in Massachusetts. The suburb of Cambridge is not far away and should definitely be visited. You are also welcome to search for nearby hotels if you would like to stay a little longer. In this venerable city, which still exudes the charm of its founding fathers today, it is one of the country's most sought-after elite universities: Harvard. You will also find the Massachusetts Institute of Technology. For those who are enthusiastic about art a visit to the Museum of Fine Arts, it is an absolute must-do. The Museum of Fine Arts is one of the country's most important art museums. Here you get abducted into different eras and cultures. From the Egyptians to the Chinese. Experience art historical events around the globe and immerse yourself in a fascinating world. You will experience on site that this city in Massachusetts has many facets. Just think about the sport. The visit to the Red Sox stadium should be on the agenda, as well as a stroll through the Public Garden Stadtpark. There are many hotels to choose from. If you would like to have a change of scenery, you can book different accommodations in the surrounding area. You have got to know some hotels and you have seen a lot of the city and its surroundings. Now the flight back home is waiting for you again. Fill up your tank again at Tomohawk Drive and return the car to the car rental company. Some hotels also have a car rental service nearby.